Chances are, you&apos;ve picked up some chatter about the new global talks on climate change. If you can&apos;t quite see how it matters to you, personally, you might want to take a peek inside your pantry. Or your candy jar. Because it might just affect your access to everything from cheese to chocolate. "It&apos;s very clear now that a changing climate will have a profound effect on agriculture," says Molly Brown, a geographer at the University of Maryland. Farmers in this state used to count on being able to plant corn in May, she says. But weather patterns are shifting. The month of May is now typically cold and wet, "so they&apos;re really not able to plant their corn until the middle of June. That delays its harvest. And then we might have an early frost." The result is less corn for Vermont&apos;s cows, and less local milk for the state&apos;s dairies. "It really changes the economic structure of how dairy products are produced in Vermont," Brown says. In Ethiopia, Brown says, the country&apos;s traditional center of farming now isn&apos;t getting enough rain for its crops. Meanwhile, rain is falling in another region, in the northern part of Ethiopia, where few people live because it used to be really dry. "So the question is, do people move up north? Can they simply move the way they farm to that new region?" Most farmers can&apos;t really see the big global patterns of climate change, and certainly can&apos;t change what&apos;s happening. Take, for example, Mars Inc., maker of Mars bars, M&M&apos;s, Snickers, Skittles and more. "[Climate change is] absolutely a threat," says Barry Parkin, the company&apos;s chief sustainability officer. "And that&apos;s why we&apos;re doing all that we&apos;re doing today." A key ingredient in the company&apos;s most tempting products, of course, is chocolate. This comes from cocoa trees, most of them in West Africa, where the climate is hot and humid. But Parkin says it may not stay that way. "Most of the models will say that it&apos;s going to get drier in West Africa, and that&apos;s not good for cocoa," he says. And cocoa is just one of the 100 or so agricultural commodities that Mars needs for its food and pet food products. Parkin is confident that his company will be able to get those ingredients somewhere. "I&apos;m less worried about that," he says. "We will find most of the crops we need to find. Maybe in different places. I&apos;m more concerned about the farmers," such as those who depend on the cocoa harvest. According to Parkin, Mars is looking for ways to help those farmers get through this. The strategy, he says, is to help those farmers become more productive. 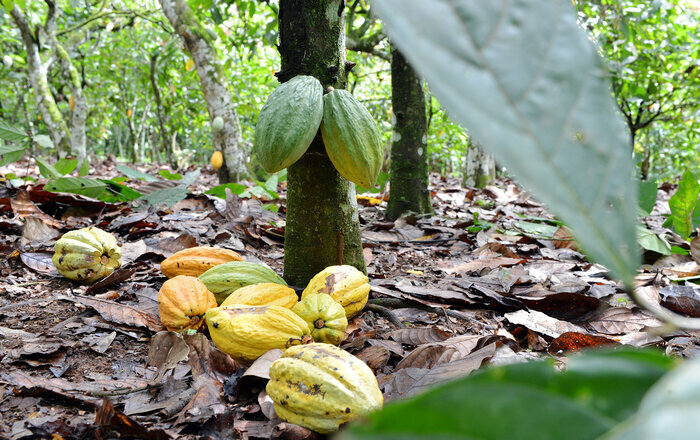 Mars is providing better cocoa trees, fertilizer and training. It puts money in the farmers&apos; pockets, "and that gives them a level of resiliency. No longer does one bad harvest cripple them," he says. That&apos;s the part of the company&apos;s strategy that&apos;s aimed at getting ready for a changing climate, and adapting to it. But because Mars is so aware that this is costly and painful, it&apos;s also trying to keep the situation from getting worse. That starts with reducing the company&apos;s own greenhouse gas emissions. "We set our first goals in 2009, for what we needed to do as a company to reduce our impact on the planet," Parkin says. According to Parkin, Mars has cut its emissions of climate warming gases by 25 percent compared with eight years ago. It&apos;s planning to be carbon neutral — not contributing to the warming of the climate at all — by 2040. "Some of these are major companies in Republican states, and they&apos;re standing up and saying we need a strong deal," Kelly says. "This has never happened before." Parkin of Mars says the food industry will be instrumental in fighting climate change. "What those companies are doing is coming together to encourage governments, basically saying to government, &apos;We need you to make similar commitments,&apos; " he says. Mars will also have representatives at the global talks in Paris, lobbying for an agreement to put the brakes on a warming climate. It&apos;s an effort to protect their own supplies of raw materials — and the lives of small cocoa farmers in West Africa.